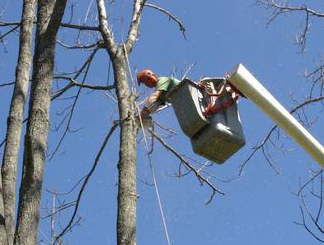 Removals | Welcome to Connecticut Arborists! The bucket operator is roping down pieces of the tree. The worker on the ground will safely control the lowering with ropes. Sometimes an old tree just needs to be removed. Maybe it has become a hazard to the property due to age and decay. If you are not sure please give us a call. We will assess its condition and give you an informed opinion.